Eleanor Lacey knows what professionals can do with the research findings they receive from SurveyMonkey. Her viewpoint is nuanced, and it’s valuable for people who feel buried in data. In other words, don’t let survey findings dictate all future actions. This isn’t heresy. Instead, it acknowledges that thoughts and concerns remain an important part of decision-making, alongside data. For a company that processes 90 million survey responses per month, that’s meaningful. SurveyMonkey is a global leader in survey data and was a named vendor to the NBC-TV news division for the 2016 election cycle. The company provides a necessary alternative to phone polling, which is increasingly unable to measure the opinions of people, particularly younger adults, who have multiplatform connectivity but no landline phones. Fortune, meanwhile, uses Survey-Monkey’s premium-level services to review public perceptions of leading—and lagging—companies. Even small businesses can post questions on SurveyMonkey to mine demographically defined results. She says SurveyMonkey’s current chief executive officer, Zander Lurie, was a close friend of Goldberg’s, is “made from a similar mold,” and benefits from having worked closely with Goldberg as a SurveyMonkey director from early on. Lacey says Goldberg’s honest and direct style influenced her. “If you do something in a kind way, you can praise or offer feedback to almost anyone,” she says. “I try to emulate that.” It seems to be the basis of her own management style. Lacey works with nine in-house attorneys and support staff in the United States and Europe. “When I think about managing other people, I think about the good managers and bad managers I’ve had—the former being the ones to emulate. SurveyMonkey lives in the tech capital of the world, where job fluidity is common. “Anyone working for me should be developing to a more advanced role, whether it is at SurveyMonkey or somewhere else,” Lacey says. When one of the employees she manages isn’t excited about their work, Lacey encourages them to talk to her about it. Sometimes the solution is to help them transition out; other times, Lacey reconfigures that person’s job responsibilities. Lacey applies common-sense human relations to her management style that many managers and attorneys overlook. Her education as a company leader, though, isn’t complete; it’s continuous. In a scenario she relates about her own misstep, she provided advice to someone who, without her knowledge, then spent an unreasonable amount of time trying to follow her advice. A week later, the employee’s supervisor reconvened with Lacey to find a solution that was easier to execute. “I understood the business and legal issues, but I didn’t grasp the operational impact,” she notes. She describes that week as a learning moment about not only knowing the business, but also understanding how legal advice can affect business operations. Lacey is emphatic about the importance of being truly immersed in the company so that the legal function is in sync with operations and the bottom line. Doing so successfully means asking questions, which Lacey loves to do, but she says it can intimidate some people. “It might drive people crazy at times because they feel like they’re being cross-examined,” she says. The solution is to establish trust and ask questions in a way that indicates authentic curiosity rather than a challenge of authority. This conundrum—the need to know things without overstepping an invisible, moving line—isn’t a new problem in the workplace, Lacey says. Particularly for women in management positions. If that rings familiar, it might be because Lacey is influenced by and works with Sheryl Sandberg, the chief operating officer of Facebook, widow of Dave Goldberg, and a director at SurveyMonkey. Sandberg’s bestselling, oft-quoted book Lean In explores and seeks to overcome the tepidness and internalized misogyny that defines how many women approach collaboration in the workplace. Lacey says she relates strongly to this problem. In addition to recognizing different problems men and women face in the workplace, Lacey has worked to recognize and manage cultural differences. While at university, her friends traveled in Europe for a semester, but Lacey instead traveled to China to study history. She returned to China before attending law school. “My first time to China was in 1987, when it wasn’t so easy to be there,” she says. She observed the sharp economic contrasts between Western-brand hotels and the conditions in which the majority of Chinese people lived. She began to consider joint-venture partnerships that could benefit both the United States and China. One of her ideas was to combine Western and Eastern economic norms, rather than the then-popular practice of separating them. I could do things if I put my mind to it,” she says. 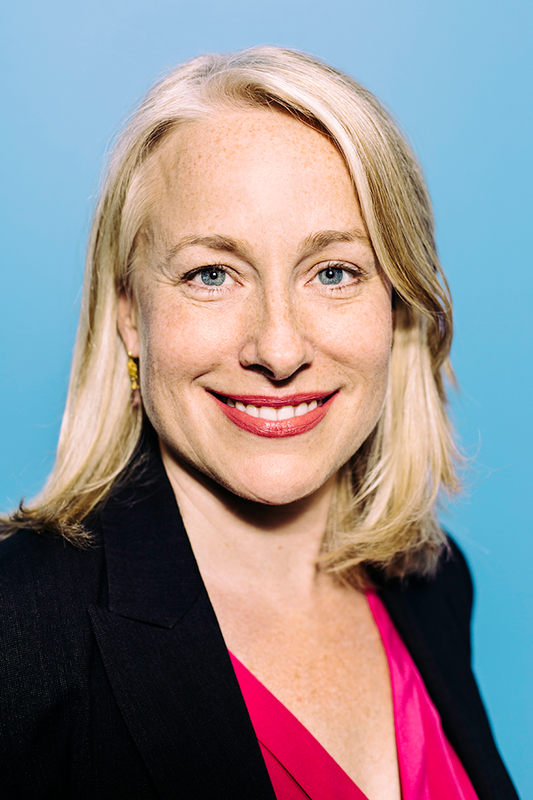 Lacey held positions at the general-counsel and vice-president level in five companies prior to joining SurveyMonkey in 2012. Today, she’s able to apply the leadership and management skills she learned abroad, from Sheryl and David Goldberg, and from attorneys who mentored her through the years. Still, the assessment of her daughter might mean just as much to this lawyer as all the signed contracts, risks managed, and acquisitions completed at work—a qualitative affirmation of a job that is quantitatively well done.